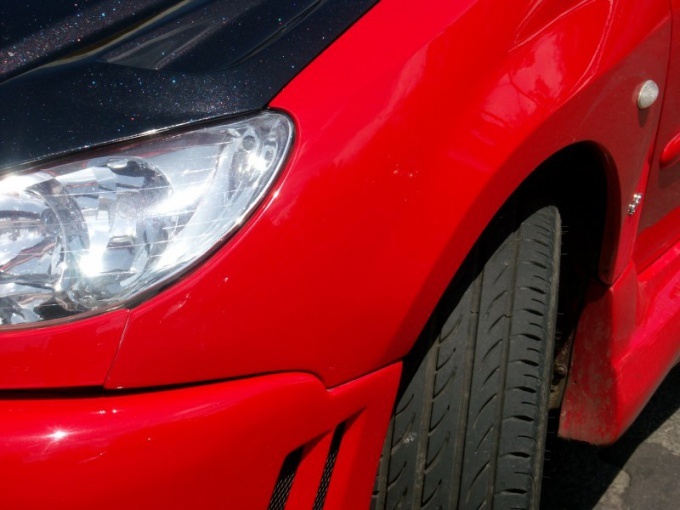 Any motorist with experience must have had a small emergency in which the car received minor damage in the form of dents, scratches or cracks. A fairly common deformation of the body are dents, dings especially on the wing. It would seem, a trifle, but unpleasant, and to go for this car is also not desirable. So how to align the surface of the wing and remove the dent myself? -a piece of drape or other coarse cloth. Treat the surface of the dent with sand paper or a diamond whetstone with a fine abrasive. The main thing is to clean the whole surface gently, leaving the old paint or other finishing marks. Clean the dent, capturing a small portion around. This should be done for uniform distribution of filler and a good coupling with the metal. After Stripping the dents be sure to degrease the treated area. Remove the moisture and particles of paint left on the dent under the influence of static electricity. Apply epoxy putty to the surface of the dent, capturing the area around her. Do not attempt to align the putty to "zero" with the wing surface. First, after drying it a little "sit down", and secondly, after drying, you will still need to Polish the treated place. Wait for the complete drying out of putty exactly to withstand the time specified in the instructions for use. Using a coarse piece of cloth Polish the surface of the wing where it is applied plaster. You must ensure that the surface was smooth, with no irregularities and have no inclusions. Apply the paint to the treated area of the wing. What you do depends on your preferences and skills of painting. You can use a brush, roller, sponge or paint restored piece with the spray. Dry the surface of the painting. Dry the car surface, or, waiting for natural drying, or by placing the wing in the drying chamber. In the latter case, the alignment process is greatly accelerated. The method described above the alignment of the dent on the fender not the only one. There is also a method, when the dent is pressed out from the inside. 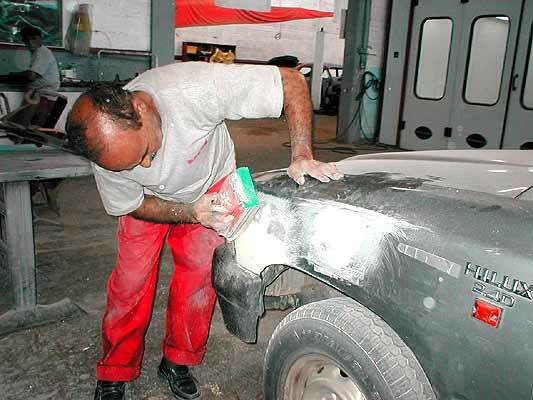 If you have no experience in squeezing dents from the inside, it is strongly recommended to Bondo a dent. This method is the most simple and easy and will not lead to additional deformation of the surfaces under the sloppy performance of work. When painting the wing manually, you can use a household Hairdryer. The injection of hot air will not only speed up the process of drying, but also will help you to apply paint evenly. All sorts of accidents (traffic accidents, bullies, playing with the ball kids, etc) can cause, which is your favorite car the damage appears in the form of dents on the body. Typically, body work car repair masters is expensive, not everyone is afford. Therefore, in order to save on the services of specialists, it is possible to try to get rid of the dents is quite simple, effective and proven method. Take the usual more or less powerful Hairdryer for drying hair. Turn it on in the heat network and location of dents on the back of a hot air stream at least 1-2 minutes (heating time depends on the capacity of the dryer, so the heat need to as long as the metal does not become hot). In any salon of computer equipment sold by the can of compressed air. They are different, but will suit absolutely anyone. Turning the spray, liberally spray onto an already heated surface dents liquefied air until, until you see traces of frost. This procedure will take no more than 20-30 seconds. Wait until the frost formed, and watch as the indentation of the metal will straighten up. Wipe the dent to a natural Shine. Try to act accurately and carefully relative to the dent, in undertaking this work. Any wrong action can later lead to peeling paint at the site of damage. Unless of course the dent on your car is very large, then this method is likely to be not effective enough. 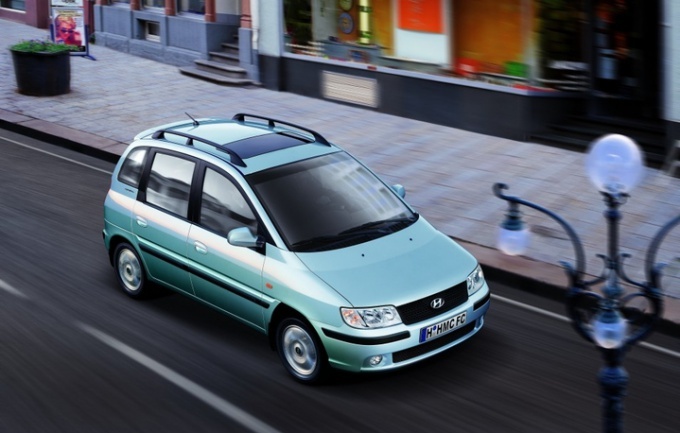 It is best used for slight damage, in order to save not only money, but time. Each driver periodically asks the question: "How to remove a dent on the back of the machine?". And each time finds a lot of answers - from how to drive the vehicle to the service to do the repairs yourself. Fortunately, the ways on how to remedy the defect of the body, fully. Dents on the car in the process arise with enviable regularity. And they are classified in different ways. For example, there are subtle, formed in the process away from falling of small stones on the car body. And there are large and deep dents, who gets the car in case of accidents. But those and other easy to fight. Before fixing dents on their own inspect the vehicle. Found a dent? Great. Take pre-prepared instruments and on the inner side of the body using a rubber mallet, very light taps you need to straighten the sheathing. If it is not, then you need the bar to wrap in a cloth, applied to a crumpled place and then gently tapping, continue to straighten the hole. Gradually, the dent should disappear. There is a category of dents that completely delete will not work. They arise if the car has received mechanical damage to some acute angle, such as angle of the Board. To resolve such a denthandy wooden block of a size sufficient to straighten the deepening of the to the highest smooth condition. But still a trace of it will remain visible. In order to fully correct the violation of the skin, you need to walk around the renovated section of the fine sandpaper, then putty it up and paint it. Then the dents will be gone. The dent on the car can occur anytime, while driving record plays no role. The reason for the appearance of unwanted indentations on the bodywork or the bumper could be unnoticed at the time a high curb, an iron pillar, etc. In any case, the dent needs to be addressed to return the car again. 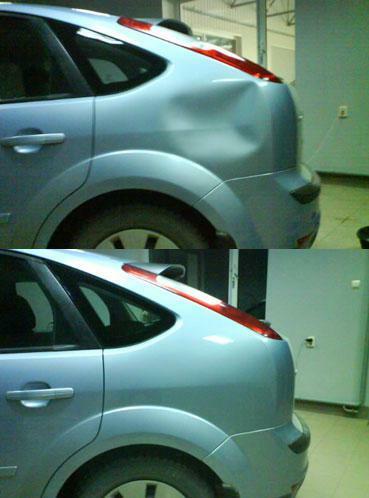 Straighten the dent on the car with your finger, if you do not hurt the ribs and the recess is small. For these holes, you can try another way: make sure that the paint is not even microcracks. Only then heat the damaged area with a conventional dryer for drying the hair for 30-60 seconds and then cool the compressed carbon dioxide for 10 seconds. Wipe the surface with a dry cloth. Go to car service, if you have dents from snow, hail or falling branches and the paintwork is not damaged. This PDR is a technology that consists in the use of heating, cooling and special suction cups. The repair will be inexpensive. It will take more than an hour for minor injuries, and removal of large dents on the car will take one hour. Please contact the car service if you have damaged the door or the dent in the car deep enough. In this case, the car will have to leave the repair for a few days. Without removing paint, priming and painting the corrected part here is not enough. 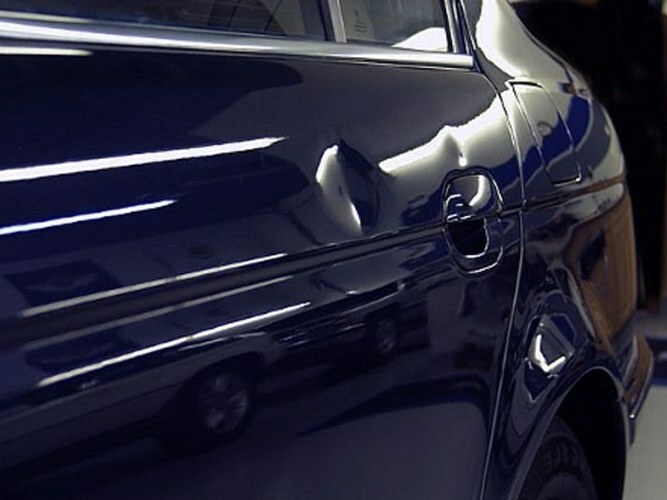 Choose proven services to remove dents on car PDR-method or with the removal of paint. 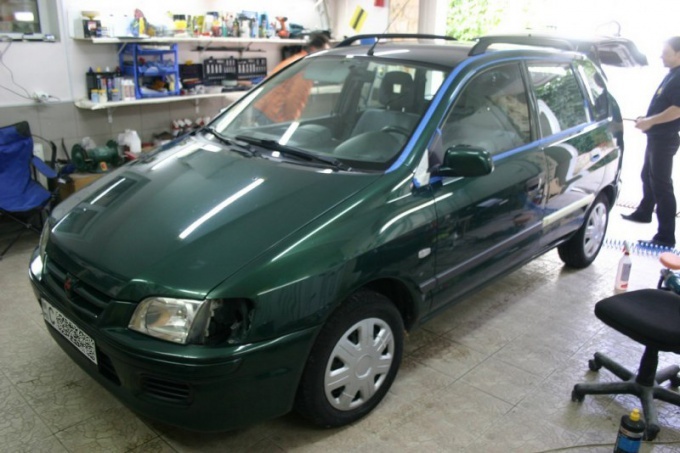 Only skilled craftsmen can make repairs efficiently, and your car will become original appearance. Unskilled employees of the station can harm the car and you will have to spend money to re-repair the dents. Beware straighten dents on the car yourself, if you don't have basic views about the location of the ribs of the car. Otherwise, instead of one minor pits to get a serious dent on the car, the repair of which will cost significantly more. Do not work without special tools. Often the work at home computer holes on the car can cause irreversible consequences that cannot be corrected. Pulling the body is quite time-consuming process. However, there is a method for carrying out this operation with the use of coins. It does not involve drilling holes in metal. This method is especially good to use in places where the metal is thin enough. Cut the welding electrode with a diameter of three mm into equal parts, the length of which is identical to the depth of the dent. Then solder them to the coins and let them cool. To contact was more durable, make a sweep the opposite side of the coin until smooth. This will help to increase the contact surface, the point of the coin. For all the work you have enough 5-6 thin electrodes. 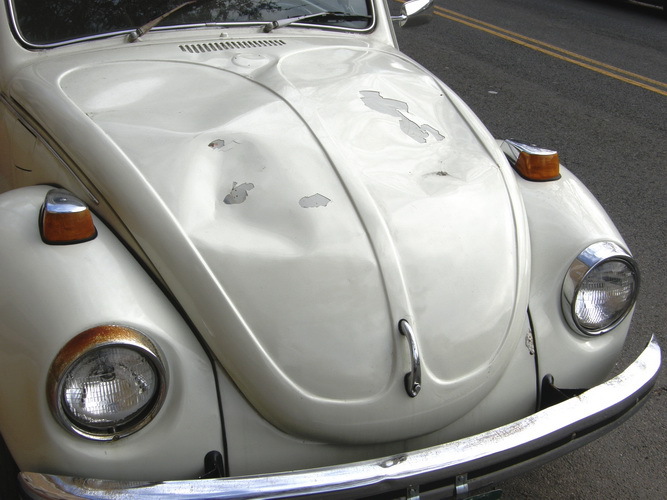 Remove all dirt, paint, rust or grease from the place of the dent using a grinding machine. Will saladita completely this area with a brush with steel wire and a propane torch. Perform the same operation and with each coin. This procedure tinning tank is preceded by a process of soldering electrodes to the dent. Apply the solder on the damaged area using a small welding torch. Cleaning is also brushed with a steel wire. Once you are able to zaludit coins and metal press to the surface of the panel value. Solder the rods to the deepest areas of the dent. After soldering remove the side burner and allow time for solidification of the solder. Once all the coins are soldered around the perimeter of the dent, pull it out using pliers. Grab each lead in turn and pull him up. If not, then put the logs of wood along the area of the dent. Then bend the electrode above the level of mites and use them as a lever, and a bar – like support. This will help to increase the pull force. As soon as you pull out the dent to the desired shape, preheat coins and remove them from the metal. Treat the entire area with the help of a grinding wheel and a file. To learn this technique, you will need to pull one dent. In practice you will see that it is possible to apply other techniques. Always work slowly and observe the safety rules. You will be able to quickly pulling this technology over time. Cars are often caught in minor accidents. The result of these troubles are scratches and dents on the front wing. The elimination of damage repairable car on their own will allow you to save money. Remove the wheel damaged the wing. Install the Jack under the Jack strong stand support. Then, under the wing place near the recess for the lights on the stiffener alone any bar. Another place in the rear part of the wing that is on the front shield of the car body. On the toothed rack of the Jack put a square tube extension. Then place the Jack between the bars and operating them as well as when performing car lift, stretch, pleated, respira wing from the inside. The dent will be reduced on the eyes, a small bump will remain only on the lower wing abortive. Putting the support on the front side, podejmuje this pothole, lightly tapping with a hammer on the inner side of the wing. Jack it does not loosen. May have decorative raised lines on the wing will be a bit of a bubble. To eliminate it, wrap a wooden rail with a rag, lay it just under the line and tap it with a hammer. Remember that if the area of the alignment enters the stiffener, to start the leveling should be with him. Edit and nikolajevaite the rib, bringing the line to its original condition, then proceed with straightening other sites. Once finished straightening, do not rush to loosen the Jack. The fact that due to lack of elasticity of the wing can again be deformed. To avoid this, at the end of work tighten the Jack a couple of clicks, overpowering this deformation-induced elasticity. And then remove it. In the case of deformation correction method with the alignment as such, almost never used: the wing was stretched a Jack and slightly tweaked at the edge. To align the indentations formed as a result of a side impact on the wing, stretching will not be enough. Needed straightening, with which the "extra" metal that is formed from the stretch will be distributed over a large number of tiny bumps. Performing a straightening remember that it should start from the edges of the dent and move to the center in a narrowing spiral. For determining the area of the end dents spend it on crosswise straightening with a file, and then nikolajevaite wing from the inside with a hammer with a sharp nose. Proceed to the alignment of the dents once the metal is tensioned, that is, when straightening the cloth will remove the tops of the tubercles over the entire surface. Conducting alignment straightening "saw", do not be afraid that hole it metal (thickness of the wing is 0.5–0.6 mm). After working canvas level the surface with solder or putty. The dent that appeared on the back of the car, can ruin not only the appearance of the vehicle, but also the mood of its owner. Often remove dents in auto repair shop. But if the body deformation is not very significant, you can try to get rid of it on their own. 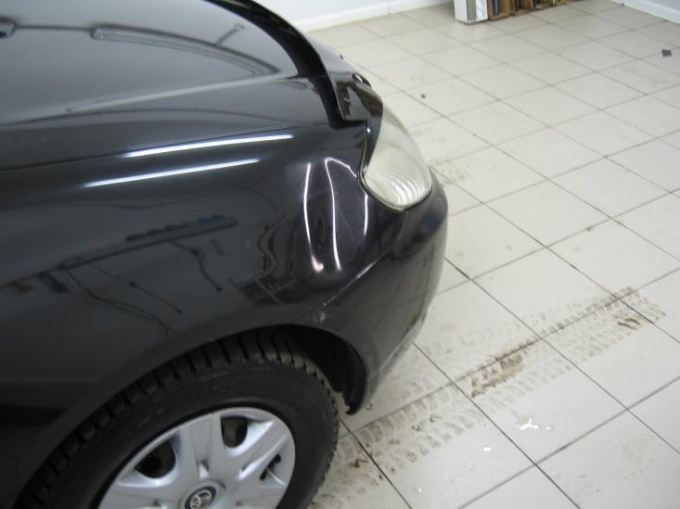 Inspect the damaged surface of the car body and determine the type of dents. Deformed plots can be divided into two categories. Dents of the first type appear weak mechanical impact, for example from a kick or a hand on the car door. Them to resolve on their own relatively simply. 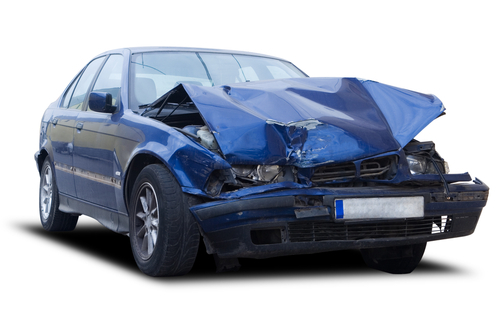 The second type of damage – when a dent appears from a collision with another vehicle or solid object. Fully straighten out such a dent to almost impossible. Prepare the space for work. Clean the damaged area from pollution. 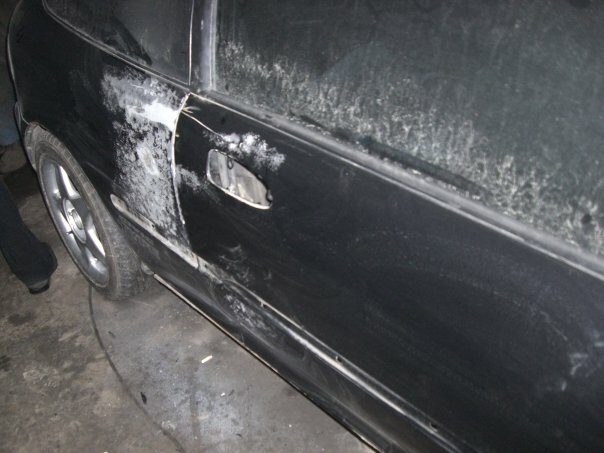 If the dent is located, for example, on the door until it stops, lift the glass, remove the inner trim and remove the other design elements that may interfere in work. Please rate the degree of damage, examining the car door from the inside. Rubber mallet from the inside, apply a few light blows on the deformed site. In some cases, the mallet does not help. Then wrap a clean rag suitable size wooden block, attach it to the dent and start making a light tapping from a hammer. Gradually, the damaged area will straighten up. If a dent appeared on the side of the car, open the Luggage compartment and remove the covering. This will provide more space for work. After inspecting the dent on the wing, follow the same steps described above for doors. Make the outside of the body surface became more smooth. Eliminating the defect, smooth external surface of the body in damaged areas, Prime and paint with matching colour paint. This will allow to almost completely remove even the smallest signs of damage. But if the dent was very significant in size, it is possible that straightening it completely without a trace you will not succeed. In this case it is better to go on additional expenses and to entrust the processing of damaged bodywork professionals.